You can import Google Docs into your Guide knowledge base. You can import up to 100 docs at a time. This is a great way to add new content or migrate existing content to your knowledge base. You can import only Google Docs from your Google Drive account, and not other file types, such as Google Sheets or Google Slides. The doc import should properly handle document images and formatting, including lists, headings, colors, font sizes, centering, indentation, and tables. Your Help Center theme defines the final rendering of any content. When you import a Google doc, there is no connection between the new article and the original Google Doc; the article is not synced with the Google Doc. You cannot export articles from your knowledge base to Google Docs. You must be a Guide Manager to connect to a Google Drive and import Google Docs. In Guide, click the Arrange content ( ) icon in the sidebar, then click Import articles. Click Connect to sign in to your Google account, if you are not already signed in. 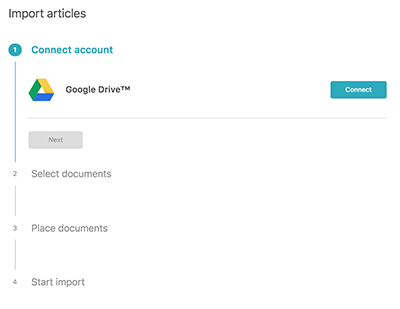 If you have not yet connected Guide to your Google Drive account, clicking Connect takes you through the process of signing in to your account and granting Zendesk Guide. In Select documents, click Open file picker. You will see all the folders and files that you have access to. Use the options in the upper-right to toggle between grid and list view or to sort your files. Search or navigate to the file(s) you want to import, then click Select. You can select up to 100 files to import at a time. The file appears in the Import Articles admin page. You can click Redo document selection if you need to choose a different file. In Place documents, click Select section to choose a section in your Help Center for this article. The articles will not be published when they are imported. Docs are imported as draft articles (Lite and Professional) or work in progress articles (Enterprise). In Start import, click Start import. Don't close the window while the importer runs. The time it takes depends on how many docs you are importing. Your docs will be imported as draft articles (Lite and Professional) or work in progress articles (Enterprise). When the import finishes, click Have a look to go to Arrange articles and find your articles or click Start a new import to import more Google docs. Note: There is no connection between the resulting new articles and the original Google Docs; the articles are not synced with the Google Docs. To access your articles later, you can find them in your list of drafts or your list of work in progress (Enterprise). I tried it. And it imported the Google Doc file from the drive. However it was only able to capture initial pages (4 out of 9). Is there a limit to the pages that can be imported? Do Light Agents have this functionality? I couldn't find the Arrange content icon in the sidebar. I'm not aware of a limit, especially not one that low. It sounds like you might be experiencing a problem that you'll need to file a ticket to have our support team look into. That's right, Light Agents do not have access to the Google Docs Importer. You have to be a Guide Manager to have access, and Light Agents cannot be Guide Managers. How does this feature work with formatting? Currently, it is not keeping the style and colors of the Google Doc after being imported to Zendesk. Can you be more specific about what elements aren't carrying over? That'll help me determine whether that's expected or not. I tried this, and the Imported Document does NOT maintain the original formatting: indentations, fonts, do not carry over. It looks as I copy and pasted, but the benefit of importing is that I shouldn't need to edit the source code to redo the original style. Is there a way to import a document from Google Drive that would then become an article with both English and French translations? Other languages included if the brand allows for it. For example, if page one was the English article and page two is the French article. Is that possible? After reading over the documentation it seems that there is not an 'Ongoing sync' relationship between your Google Docs account and your Zendesk Guide. It is imported in, and then edits are then able to be made within Zendesk. What Dan said is correct. Translations need to be imported as per the article shared to be properly categorized as such. Let us know if you need anything else! Is there a possibility available to sync the article with the google doc? So light agents will be able to edit the Google doc, and won't need the Guide manger rights. I was excited to hear about the google drive feature for importing articles. 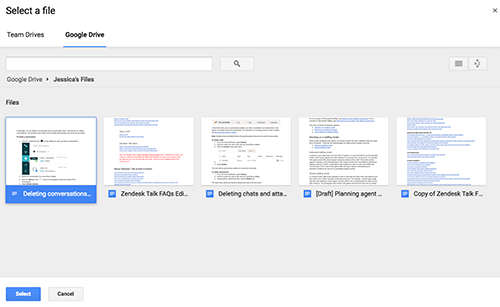 Based on my experience, I prefer to create article content and format in google docs as opposed to Zendesk. I am a bit bummed as I went to import a couple articles from Google docs and the format (meaning my number and bullet lists) did not transfer over. Meaning that all the # and bullet points were on on the left indent. Is there something that I am missing? Thank you for the help! I didn't see a answer posted to the question that asked if there's a way to use this feature to update/replace the content of an existing article? Or is it only for importing new articles? It seems that question has slipped through the cracks, thanks for making us aware. The Google Docs Importer does not enable update or or replacement of existing Guide articles from an associated Google Doc. It is only for (bulk) import. I finally had a chance to test this and the formatting issues mentioned below are present. Bullet points and numbers lists do not get formatted correctly when there is more than 1 "level" (i.e., you cannot have subpoints). Colors are not imported exactly as shown in the Google doc so the text color that most closely matches is applied. I'm going to generate a ticket on your behalf and pass this over to our Customer Advocacy team here. We'll most likely need to take a look at the Google Doc you're importing as well as any relevant articles that have incorrect formatting. You'll receive a follow-up email stating your ticket has been created so feel free to reply back to that with any of additional information/examples you can provide. I am phasing the same formatting issues that Kathleen has listed. Are there any updates on this? Some of the formatting issues were resolved with a new release, but I was still experiencing issues with the bullet/numbered lists and some of the spacing issues. I got the ticket escalated, but I'm still waiting for an update. I would recommend submitting a ticket if you haven't already. "The Google Docs Importer does not enable update or or replacement of existing Guide articles from an associated Google Doc. It is only for (bulk) import." Being able to at least overwrite an existing article would be a big improvement here. I don't need it to sync back to Google Docs, but being able to create a new revision of an existing article by importing from Google Docs would significantly help. Right now, it's not possible for subject matter experts to be able to mark up and leave comments on an article with suggested changes. So we use google docs for collaboration on the content creation and editing process. More collaboration tools natively in ZD would eliminate the need for us to use the Google Doc importer. I recommend cross-posting in our Guide Product Feedback Forum to help provide visibility to our Guide Product Managers as well as other users in need of a similar feature. How do you change the email address your import articles function is connected to? Hi Niraj! Sorry for the delay here. How far into the steps did you get? If you start over with a new import, you should be re-prompted to select the Google address with which you'd like to authenticate. If you don't see the account you're looking for in the list, click "Use another account" and you should be able to sign in with, and then select, a different Google address. Glad to hear it's resolved, Niraj!